Casa Laguna, an attractive and comfortable fully furnished family home, is located mid-island in Colonias (see map) on the island of Isla Mujeres. Located behind a privacy gate, this fully-furnished property has two units: a two-story house and an apartment which can be a combined or separate rental. The house has 2 bedrooms (1st floor & 2nd floor both with queen beds), 2 full bathrooms (1st floor with newly constructed walk in shower; 2nd floor with tub and shower), living room (with futon couch that opens into a double bed) dining area, spacious fully-equipped kitchen, garden patio, laundry/storage room and a large roof top terrace with a beautiful view of the Salina Grande (lake) and a slice of the Caribbean Ocean two blocks away. You can watch the sunset from both the terrace off the 2nd floor bedroom and the rooftop. There are ceiling fans in all rooms, A/C in the bedrooms, a computer/work area, WiFi throughout the house, flat screen cable TV , interesting architectural touches and a walk-in closet in the upstairs bedroom. The very private and enclosed back yard of the house has a patio with ceiling fan and a beautiful garden with tropical plants and coconut, banana and lime trees. You can see the native plants and trees on the lake along with herons, egrets and other native birds, while resting in the hammock on the patio. The apartment has a kitchenette, dining area, bedroom (queen bed), bathroom with shower, and large terrace overlooking the garden and salina. All rooms have ceiling fans and there is A/C in the bedroom. The apartment is also set up with WiFi internet access. Around the Neighborhood – Colonia Meteorologico is a truly local neighborhood that is safe, lively and friendly. 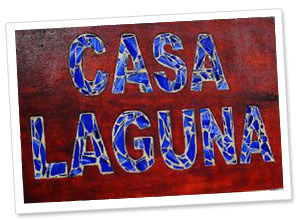 Casa Laguna is just steps away from many small, family owned shops. Just up the street is a great bakery, La Mexicana’s achiote-roasted chickens, Letty’s and Dona Mari’s local “cocina economicas” and several mini-supers. A short walk away is Mango Cafe, Manolito’s, Brisas Caribbean Grill and a new ice cream shop. Also within walking distance: Mango Cafe, Ball Park Tacos, Deysi & Raoul’s El Charco, Lo Lo Lorena, Tonicho’s, Basto’s, Limon … and the Express Supermarket, a small mercado publica and Chedraui. You’ll also find stands in the neighborhood with fresh squeezed juices, Cochinita Pibil, tamales, fruits and vegetables. And what you can’t find comes to your door, thanks to the colorful vendors who walk or bicycle by selling fresh hot tortillas, tamales, ice cream, pastries, Mayan honey and more. The house is also adjacent to the Salina Grande promenade, which is popular for walking and jogging. Also walk-able: basketball, tennis, soccer and baseball. You’re just two blocks away from an incredible spot on the Caribbean coast, where you can see a glorious sunrise and climb down to a deserted beach to go sea-glass hunting, walk the beach or just sit and read a book. Both the apartment and house provide fold up beach chairs. El Centro or downtown is a quick and easy 10 minute cab ride, as is the popular North Beach, a swimming and sunbathing oasis with beach bars. 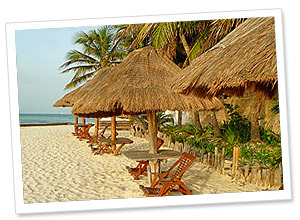 Just 5 minutes by taxi in the other direction is Sac Bajo with beach clubs that have restaurants and pools. 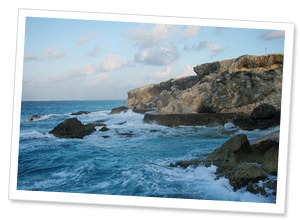 Bus service, bikes or taxis make any part of the island easily accessible to Casa Laguna.